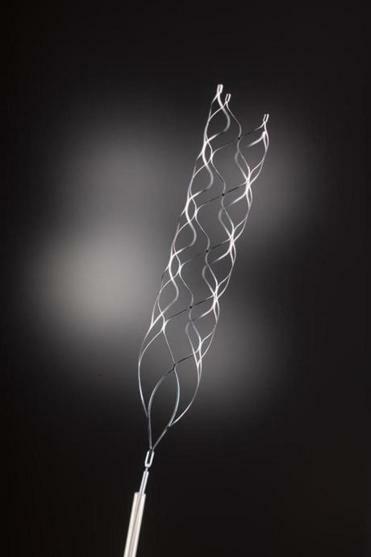 Patients treated with brain stents such as this one by Covidien were far more likely to be alive and able to live independently after their stroke, studies showed. NEW YORK — Stroke experts are reporting a major advance: Stents similar to the ones used to open clogged heart arteries also can be used to clear a blood clot in the brain, greatly lowering the risk a patient will end up disabled. Patients treated with these brain stents were far more likely to be alive and able to live independently three months after their stroke, doctors said Wednesday at an American Stroke Association conference in Nashville. The treatment was so successful that three studies testing it were stopped early, so it could be offered to more patients. One study also found the death rate was cut almost in half for those given the treatment. “This is a once-in-a-generation advance in stroke care,” said the head of one study, Dr. Jeffrey Saver, stroke chief at the University of California Los Angeles. An independent expert, Dr. Lee Schwamm of Massachusetts General Hospital, called it “a real turning point in the field.” For many patients, “this is the difference between returning home and not returning home,” although only certain types of patients can be offered it, he said. Stroke care “needs to be completely changed” to make the treatment more widely available, said Dr. Walter Koroshetz, acting director of the National Institute of Neurological Disorders and Stroke. “This has taken stroke therapy to the same place that heart attack therapy is now,” he said. Most of the 800,000 strokes in the United States each year are caused by a blood clot lodged in the brain. The usual treatment is clot-dissolving medicine called tPA. When that doesn’t work, doctors sometimes try devices pushed through blood vessels to pluck out the clot, but several studies found they didn’t help. However, newer devices — metal mesh cages called stent retrievers — open an artery much faster and with less damage to the blood vessel. Unlike heart stents, which stay in place to prop the artery open, the brain stents flatten the clot, trap it, and are removed with it. Two brands are sold in the United States — Trevo, made by Stryker Corp. of Kalamazoo, Mich., and Solitaire, made by Covidien, now part of Minneapolis-based Medtronic Inc. They won approval in 2012 based on their ability to remove a clot — not because there was evidence they made patients better. Some people who got them had dramatic results. Don Sadoway, 64, a chemistry professor at Massachusetts Institute of Technology, was having a holiday lunch on Dec. 23, 2012, at a Boston restaurant when he suddenly found he couldn’t lift his wine glass for a toast. His wife was perplexed. “I said something unintelligible to her and all of a sudden my right side collapsed,” he said. Doctors at Massachusetts General gave him tPA, but it didn’t work, so they tried a Solitaire stent. “Two hours later, I was sitting up, talking to my kids,” said Sadoway, who is fine now except for small problems with memory and fine motor skills. Last fall, the first solid evidence that these devices helped patients arrived. A study in the Netherlands that tested a variety of clot removers, mostly stents, found these treatments greatly lowered the risk of disability in patients whose clots were not dissolved by tPA. Stroke experts said more studies were needed to confirm the success. The three new studies do that; all were stopped early because independent monitors saw better results three months later in those treated with devices after tPA failed to dissolve their clots. Two tested just the Solitaire stent and the third tested a mix of devices, but mostly stents. Patients all sought help fast, had clots that were not opened by tPA, and no evidence of irreversible brain damage on CT scans.